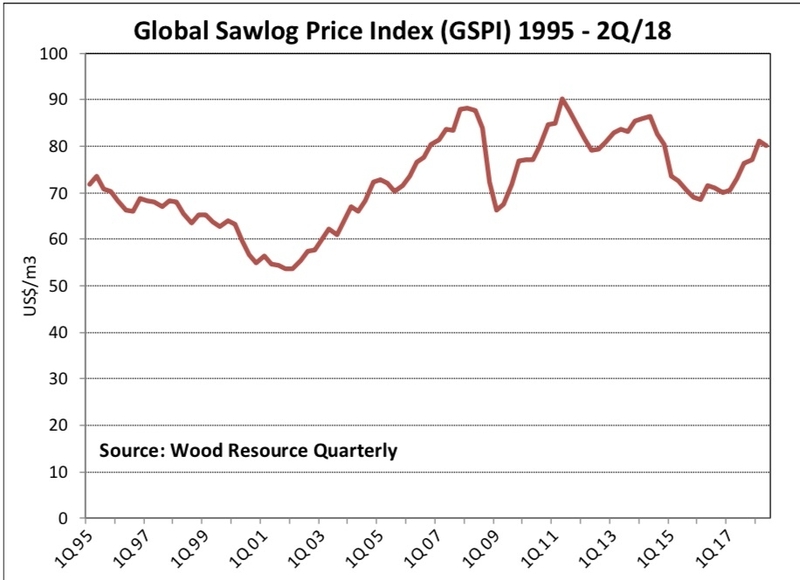 Dec. 4, 2018 – The Global Sawlog Price Index (GSPI) fell by 1.4 per cent from Q1 2018 to Q2 2018. This was the first quarter-over-quarter decline since the Q4 2016. Sawlog prices fell on all continents (in U.S. dollar terms) except for North America, where prices in Q2 2018 were 3.0 per cent higher than the previous quarter and up 13.5 per cent from Q2 2017. Most of the price increases in North America over the past year have occurred in Western U.S. and Western Canada, while log prices in Eastern Canada and the U.S. South have stayed quite stable during the same time period. In the Western U.S., sawlogs prices rose sharply during 2017 and early 2018 but came to a halt in late spring when prices slightly declined. With limited interruptions in harvesting operations and declining log exports in the first half of the year, log supply was sufficient in the summer, which eased the consistently upward price pressure seen over the past two years. Prices are likely to continue downward from their high levels seen in the second half of 2018 because of the weakening demand for softwood lumber in the U.S. The biggest price declines for sawlogs from Q1 2018 to Q2 2018 occurred in Russia, Brazil and Eastern Europe. In the Baltic States, sawlog prices fell about three per cent quarter-over-quarter in Q2 2018, after having increased by more than 20 per cent over the past two years, reports the Wood Resource Quarterly. Although Russian softwood sawlog prices continued their four-year upward trend in Rouble terms in Q2 2018, the country had their largest quarter-to-quarter decline in U.S. dollar terms in two years because of the strengthening dollar. In Q2 2018, average prices in both the Northwestern provinces and in Siberia were down to the same level seen in Q2 2017.